Christopher J. Donadio has taken over 40 verdicts as lead trial counsel in the various State and Federal courts of New York and New Jersey. In addition, Mr. Donadio has represented his clients in the appellate courts, having drafted and argued appeals in the State and Federal courts of New York. Mr. Donadio’s practice consists of catastrophic personal injury and medical malpractice. He is admitted to practice in both New York and New Jersey. 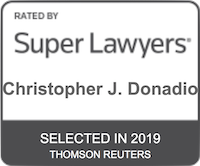 Mr. Donadio has been recognized as a SuperLawyers Rising Star in the New York Metro area from 2013 to the present, as well as a Best Lawyer in New York since 2018. 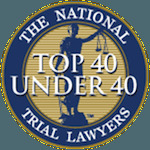 He has also been named to the National Trial Lawyers’ Top 40 Under 40 attorneys of New York list. In addition, as a result of Mr. Donadio success as a trial attorney, he has been asked to lecture by various organizations, including the American Association for Justice, the New York State Trial Lawyers’ Association, the New Jersey Association for Justice, and the American Board of Trial Advocates. Mr. Donadio attended Duke Law School where he was a member of the Duke Journal of Constitutional Law and Public Policy and a member of the Moot Court Team. As a result of his oral advocacy abilities, Mr. Donadio was selected to represent his law school at the prestigious National Moot Court Competition. During law school he also had the opportunity to work at legal clinics where he provided free representation to those who could not otherwise afford to hire an attorney. Through his work at these clinics he developed a passion for aiding individuals who had suffered significant harm. 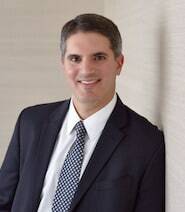 Prior to joining the firm, Mr. Donadio worked for a corporate litigation firm where he represented large corporations. After a few years as a corporate litigator, Mr. Donadio decided to follow his true passions and transitioned into the fields of personal injury and medical malpractice, where he could assist those who were truly in need of justice. 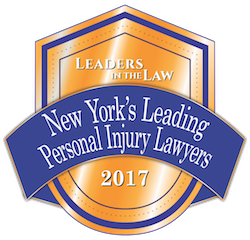 Prior to joining Gair, Gar, Conason, Rubinowitz, Bloom, Hershenhorn, Steigman & Mackauf, Mr. Donadio spent almost seven years at a New York plaintiff’s personal injury firm where he developed his craft of fighting for those who suffered severe harm. $3,000,000 verdict for a man who suffered a late diagnosis of pancreatic cancer as a result of medical malpractice. $1,225,000 verdict for a woman who suffered a collapse of the arch of her foot as a result a podiatrist’s malpractice. $1,000,000 verdict for a man who suffered a fall causing a serious knee injury as a result of the New York City Transit Authority’s failure to properly maintain its subway grates. $5,850,000 settlement for a construction worker who suffered a spinal injury as a result of a roof collapse. $3,500,000 settlement for a child who suffered significant harm as a result of his doctor’s failing to diagnose compartment syndrome. $1,450,000 settlement for a New Jersey high school student who was struck by a motor vehicle while crossing the street. $1,400,000 settlement for a woman who suffered pelvic, wrist and shoulder injuries as a result of being struck by a bus. $1,100,000 settlement for a New Jersey construction worker who was struck by a forklift and suffered injuries to his legs. $1,000,000 settlement for a construction worker who suffered a crush injury to his thumb as a result of a collapse of a small crane. I could not choose better law firm for my case than Anthony Gair's firm. I am satisfied above and beyond with their work. The best attorneys I have ever worked with. They knew everything about my case and even more than an attorney supposed to know. They even had deep medical knowledge to successfully argue with expert witnesses. They are not like most of the attorneys who don't really care about their cases. They are prepared, and they spend time to know every little detail about the case. My attorney Christopher J Donadio always knew what to say and when to say it, or how to answer a question the best and most proper way. He always sad "We have many cases, but you only have one...". Thus before and during the trial period, he only worked with my case and nothing else. I witnessed a lot of preparation!!! Moreover, they are not only professionals but honest and very friendly as well, so it was a pleasure to work with them.